The most complicated thing is to find a stone similar to a sole but it is not as complicated as it seems. You can take a walk on the beach, in the mountains or on the river looking for stones. It is very possible that you find that kind of stone. Also look for five small stones to make the fingers (this is easier). Get a nice and deep picture frame. It is better not to paint the stones because the final result will be more natural and beautiful. Apply varnish for the stones. 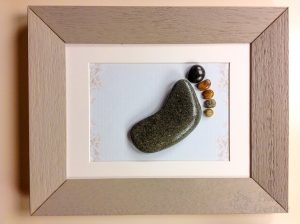 Paste the stones to the picture with special glue for stone. Finally, you can complement it by adding a small wooden insert for that special gift. If you liked to make pictures with stones you can find more in the Pictures category. We hope to have left a mark on you, be happy creating with PiedraCreativa.